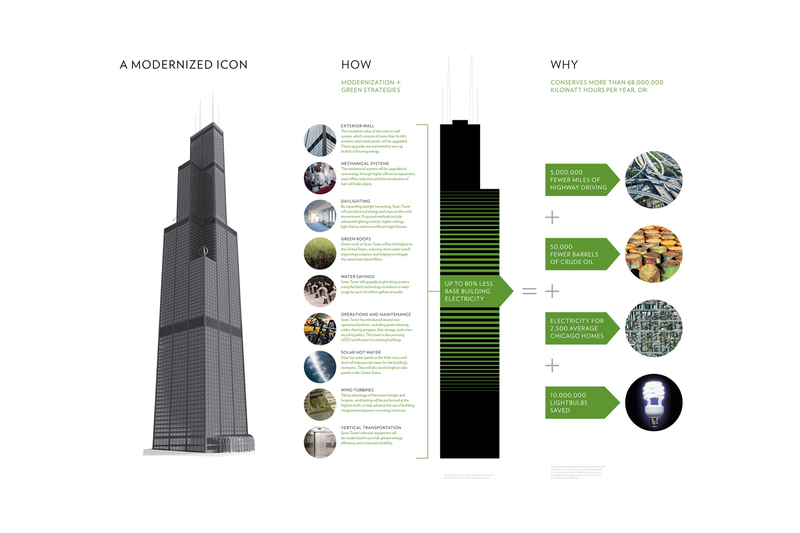 AS+GG has been commissioned by the owners of Willis Tower — formerly known as Sears Tower — to design a retrofit/greening project that will use sustainable technologies and strategies to modernize the 1973 landmark and make it much more energy efficient. The project will reduce the base building electricity use by 80 percent (including energy savings and co-generation), equivalent to 68 million kilowatt hours or 150,000 barrels of oil per year. 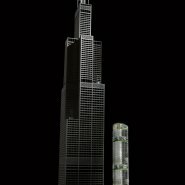 In a related development, AS+GG has also designed a highly sustainable, 50-story five-star hotel to be built on the south side of the Willis Tower plaza. 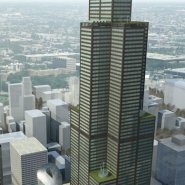 The hotel will operate using only part of the energy savings from the Willis Tower greening project, which means the hotel will draw net zero energy from the power grid. 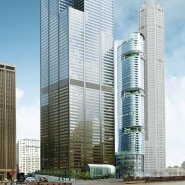 The greening project at Willis — the tallest building in the United States and also one of the largest in terms of square footage — will demonstrate how to save a significant amount of energy and improve the occupant experience of an existing building during a large-scale 21st century modernization. • Efficiency improvements to the building’s exterior envelope and windows. 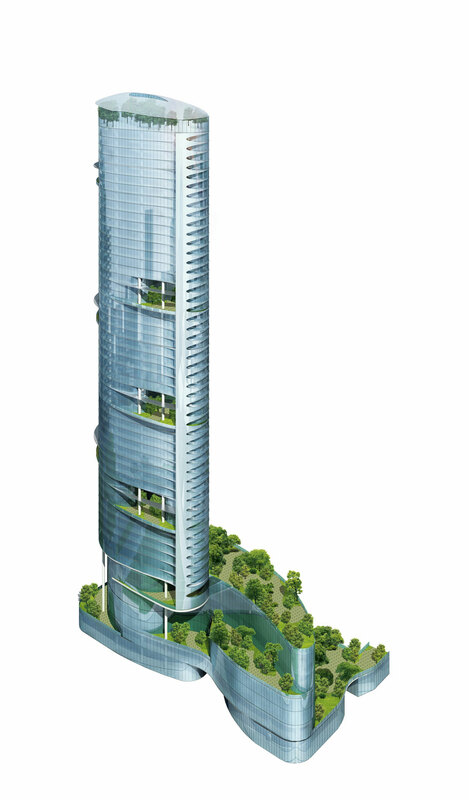 The tower has 16,000 single-pane windows. Sustainability plans for the building call for a window replacement and glazing program. Strategies to achieve a thermal break of the curtain wall are also being investigated. These upgrades would achieve savings of up to 50 percent of heating energy. • Mechanical systems upgrades in the form of new gas boilers that utilize fuel cell technologies, which generate electricity, heating and cooling at as much as 90 percent efficiency. Mechanical upgrades also will include new high-efficiency chillers and upgrades to the distribution system. 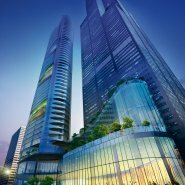 • The tower’s 104 high-speed elevators and 15 escalators that will be modernized with the latest technology to achieve 40 percent reduction in their energy consumption. • Water savings that will be realized with conservation initiatives through upgrades to restroom fixtures, condensation recovery systems and water efficient landscaping, which will reduce water usage by 40 percent and save 24 million gallons of water each year. 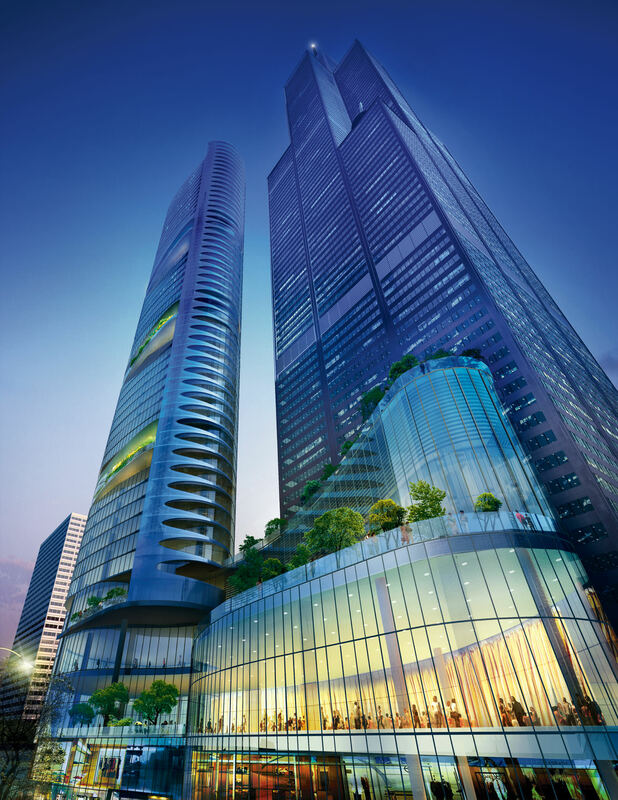 • Lighting that will be upgraded through advanced lighting control systems and daylight harvesting, an advanced lighting control system that automatically dims lights in tenant spaces based on the amount of sunlight entering through the windows. Combined, these upgrades will save up to 40 percent of lighting energy consumption. • Renewable energy like wind and solar, and technologies like green roofs that will be tested. 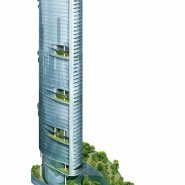 Wind turbines will be tested to take advantage of the tower’s height and unique set-back roof areas. Solar hot-water panels will help heat water for the building. Green roofs that can sustain high- altitude conditions, and that will be among the tallest in the world, will be tested to reduce storm water runoff, improve insulation, help mitigate the urban heat island effect, and provide pleasant vistas for tenants overlooking the areas. 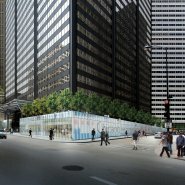 In concert with the new building construction, Willis Tower’s grade-level plazas and retail will undergo a transformation. 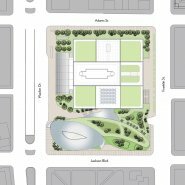 A new park on Wacker Drive will feature a reflecting pool, landscaping and seating, creating an inviting public space. The Adams Street granite wall will be replaced with an interactive digital display and glass storefronts at Adams and Franklin. 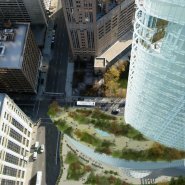 Trees will be planted along Adams to form an accessible planting terrace. 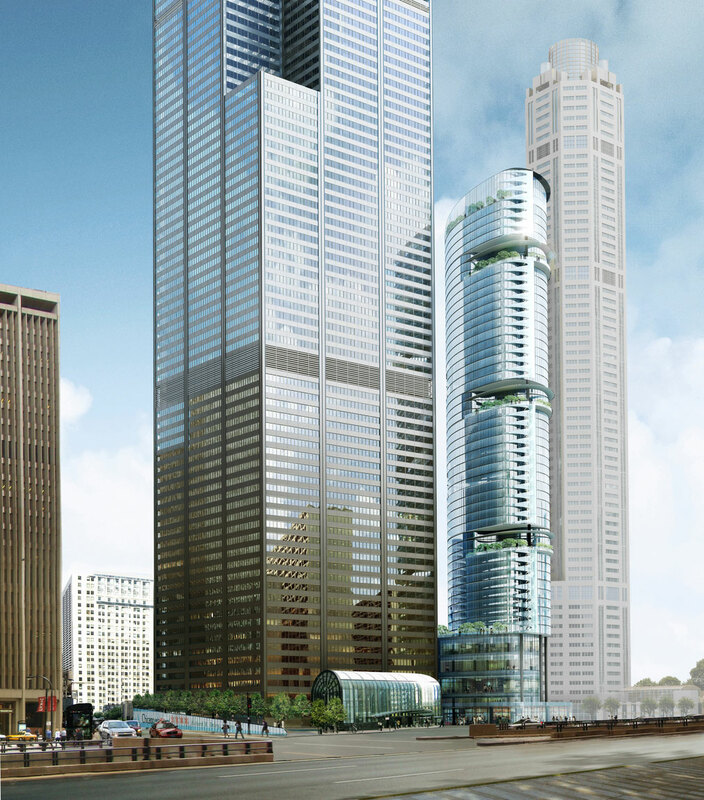 The new hotel will feature a retail plaza level that complements the Willis Tower restaurant Level 2. 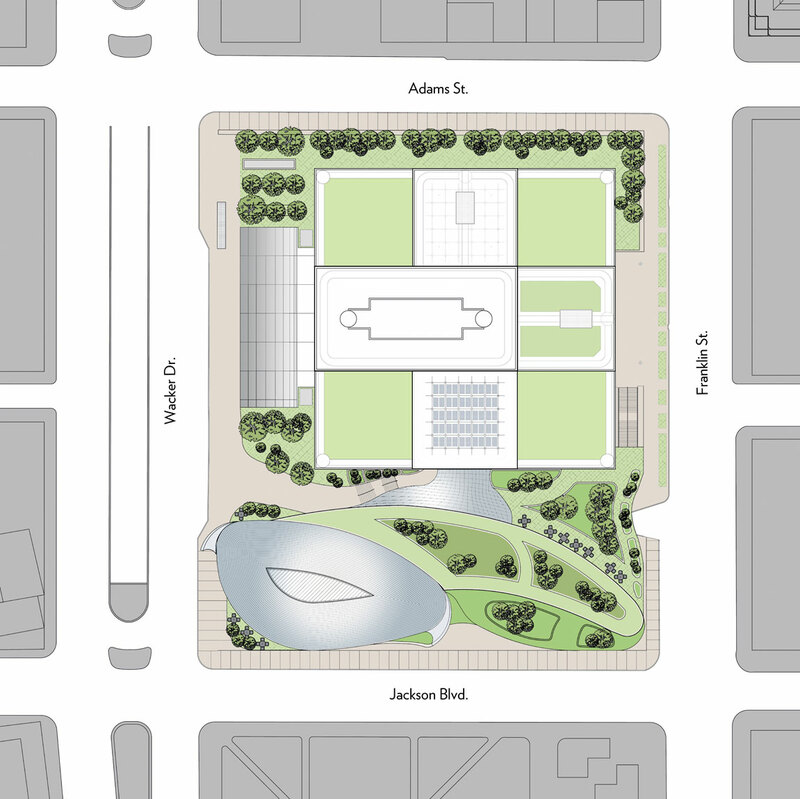 The upper plaza will include an indoor connection to the hotel, outdoor seating and additional landscape elements. 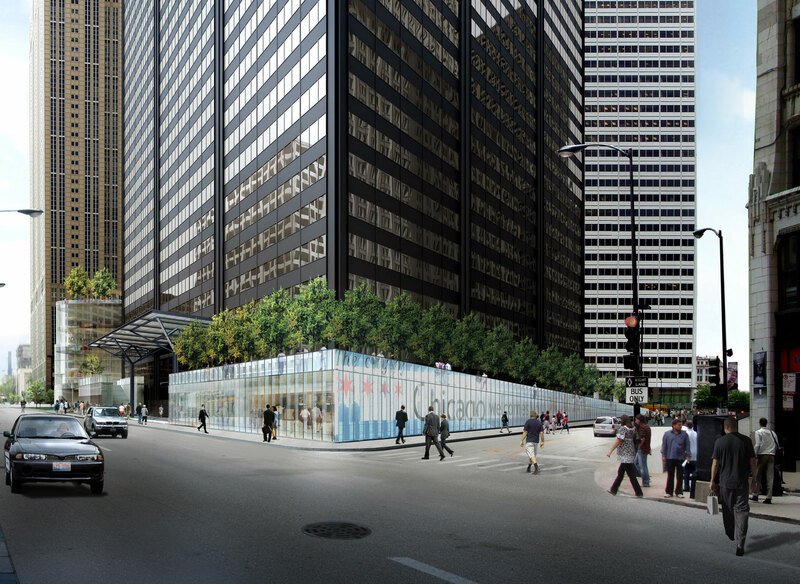 A new skydeck entry will be located within the hotel building’s podium, integrated with retail along Jackson Street. Visitors will enter in the same location, but will be able to take escalators to the Skydeck attraction on LL2 in order to decrease wait times. 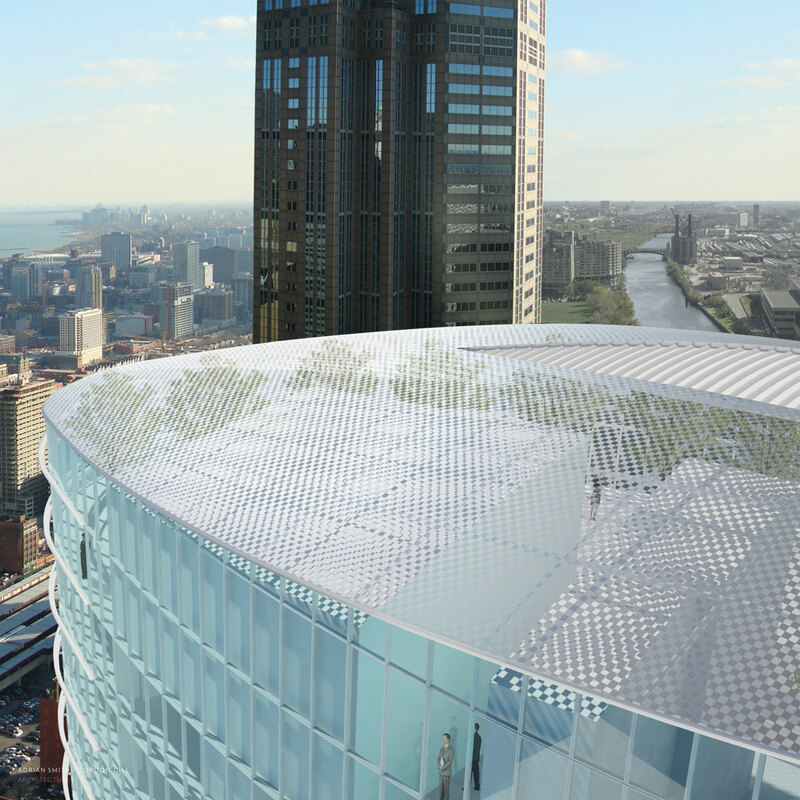 The escalators will be underneath an attractive glass dome that connects Willis Tower to the new hotel. Direct access to the outdoor plaza and restaurants will be provided for skydeck visitors. • Sky gardens: Lushly landscaped green spaces at various levels will be among the building’s signature amenities—both for hotel patrons and for viewers from neighboring buildings. 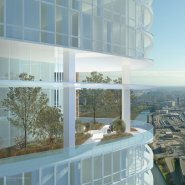 • Solar deck: A naturally lit indoor garden space, covered by a glass dome featuring integrated photovoltaic panels that harvest solar energy, will offer stunning views of the skyline. A louver system will regulate the flow of air through the deck. • Double-walled exterior: The building facade features one of Chicago’s first double-wall envelopes. 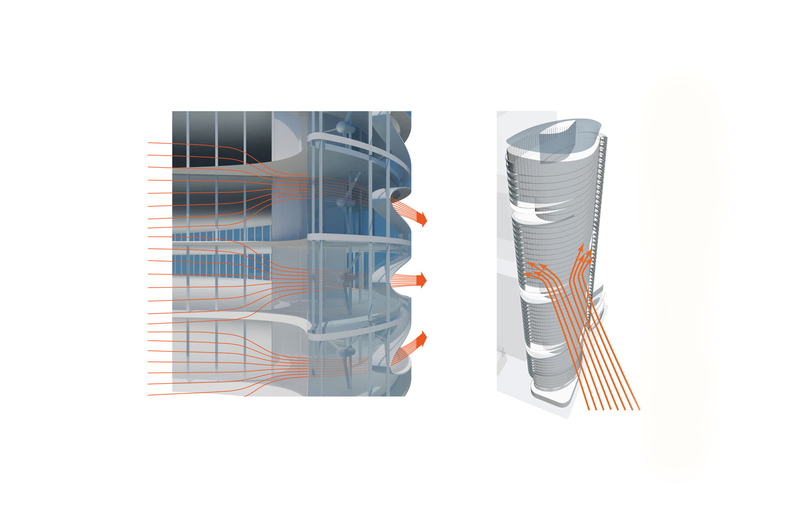 Between the walls, an interior air space provides a blanket around the building that traps solar heat, venting it in summer and providing warm air in winter. • Green roofs/planting terraces: Landscaped event spaces add an outdoor dimension to the luxurious interior, even as they add insulation and reduce storm water runoff. 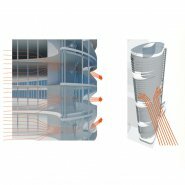 • Building-integrated wind turbines: A series of wind turbines, strategically placed to harvest wind from the southwest as it flows over the smooth front facade, generate energy for the hotel. Wind is channeled into the turbine openings, which funnel it to accelerate its speed and increase power generation. • Efficient systems: The latest technology in mechanical, electrical and control systems for optimized energy performance. • Sustainability standard: Designed for a LEED Gold rating. The 500-unit, five-star hotel’s amenities will include an elegant lobby, dining room, pool and spa; modern conference facilities for small and groups, with direct connection to sky terraces and green roof gardens on multiple levels; an 8,000 square-foot grand ballroom; top-of-the-line finishes made with renewable and/or recycled materials; new retail storefronts along Jackson and Franklin; and a grand outdoor plaza featuring landscaped terraces connecting the hotel to Willis Tower. 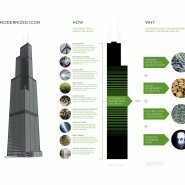 The Willis Tower In 150 Years: Adapted, Demolished or Abandoned?